This headline may have caught your attention seeing that it sounds like terrible advice. But wait, let them explain. Well, let me explain Trulia’s rationale here so you aren’t up in arms. The company analyzed housing markets throughout the country where home prices are initially out of reach for Millennial households, but eventually affordable thanks to wage growth. In other words, buy a house today even if it’s not affordable by traditional measures because it will be in the near future. And do so because you may otherwise miss out. The company looked at metros where the median home was “feasibly unaffordable” to those aged between 25-34, where monthly mortgage payments exceed 31% of gross monthly income when putting down 10% and taking on PMI. But these payments didn’t exceed 43% of income, which is the QM limit most lenders abide by. Then they considered projected income growth of Millennials to determine how many years it would take for mortgage payments to fall below 31% DTI. First off, they discovered that 73 of the 100 largest housing markets in the United States are already affordable. This includes places like Detroit, Pittsburgh, Indianapolis, Dayton, and other Midwestern cities. So that’s good news for many Millennials nationwide. But that still means many major housing markets are still unaffordable to young prospective home buyers. For example, Washington, DC, Los Angeles, Seattle, Boston, Portland, Miami, Denver, New York, and others are out of reach. However, using Trulia’s wage growth projections, many of these housing markets would actually become affordable fairly quickly. For instance, in DC, it would only take 0.3 years for mortgage payments to become affordable because only 31.2% of median income is initially spent on a median priced $364,345 home. There are also rather short timelines to affordability in Silver Spring, MD, Madison, WI, and Tacoma, WA. But in hotter spots like Portland, Seattle, and Boston, it would take anywhere from four to six years to actually afford the mortgage. Initially, borrowers would be spending closer to 38% of income on the mortgage alone, which could signal payment distress in the not-too-distant future. 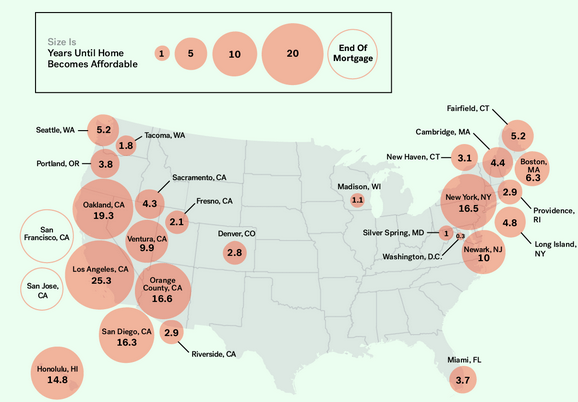 Interestingly, pretty much all of the metros in the United States would eventually become affordable during the life of the loan except for San Jose and San Francisco, CA. Still Not Affordable After 30 Years! Amazingly, even after 30 years of inflation and wage growth, mortgage payments still wouldn’t be affordable in these two red-hot metros. And in Los Angeles, Millennials would still spend 25 out of the 30 years on their hypothetical 30-year fixed mortgage struggling to make payments. Of course, most homeowners don’t stay put for anywhere close to 30 years so it might not make much of a difference whether payments are eventually affordable. Additionally, banking on future wage growth or a job promotion isn’t necessarily the brightest idea when making an offer on a home. Perhaps focusing on living within your means is a better strategy, or holding off until you can actually afford a home. Remember, there are a lot of hidden costs to homeownership that are often overlooked, such as maintenance, HOA fees, utilities, insurance, taxes, and so on. So buying a home you can’t afford at the outset is probably a bad idea, especially if you can only afford it while mortgage rates are near their lowest levels ever. An even worse idea would be buying a home today with the help of an adjustable-rate mortgage assuming you could refinance in the future once you make more money. 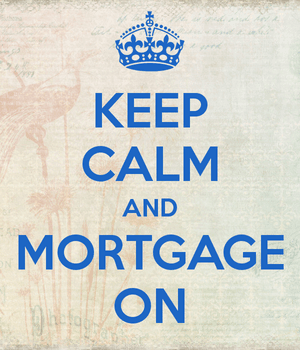 Again, there’s no guarantee you will make more money or qualify for a refinance if any number of things go wrong. Sure, rents are high and could be reason to buy, but try to find something in your price range and/or negotiate instead of entering a bidding war. This post from Trulia smells rotten to me, and could be a bad sign for home prices moving forward.